State Senate postpones hearings for ethics training (CalWatchdog.com link) - In response to ongoing corruption cases, the California State Senate will postpone all committee hearings scheduled for April 23 and in their place host an all-day ethics discussion and training session. The Senate Ethics Discussion and Training day comes as three suspended members of the State Senate face ongoing criminal charges ranging from weapons trafficking to public corruption. The most serious of the three cases surfaced in late March, when the FBI arrested Sen. Leland Yee, D-San Francisco, on weapons trafficking and pubic corruption charges. Allegedly referred to as “Uncle Leland” by his co-conspirators, the San Francisco Democrat allegedly offered to smuggle millions of dollars worth of automatic weapons into the United States from a Muslim separatist group in the Philippines, according to the FBI affidavit. In February, state Senator Ron Calderon was charged with a 24-count indictment in connection with bribery and corruption. In January, state Senator Rod Wright, D-Inglewood was found guilty of eight counts of felony voter fraud, perjury and filing a false declaration of candidacy. Wright’s case did not involve any allegations of bribery or corruption. Following Yee’s arrest, Steinberg called upon “our entire body to take a deeper look at our culture.” But he has also recognized the limits of an ethics review. “I know of no ethics class that teaches about the illegality and the danger of gun-running,” Steinberg said during the Senate’s debate over whether to suspend the members with pay. The Senate has been mixed in its response to the scandals. Earlier this month, Senate Democrats canceled a luxurious annual fundraising event, known as the Pro Tem Cup, citing the “recent and extraordinary breaches of the public’s trust” by three Democratic state senators as the reason. However, the Senate Democrats also kept the campaign cash, and in place of the golf tournament, personally called each of the event sponsors. Over the weekend, the California State Senate scrubbed the websites and online archives of the three Senators that face criminal charges. In addition to pictures and video clips, the websites contained detailed information about the senators’ legislative achievements and ties, which could shed light on past deals or questionable votes. Although some of the information, such as bill language and votes, remains available on other websites, the individual pages acted as a repository or central clearinghouse for information about the Senators. Leland Yee scandal blunts increasing approval of Legislature (Sacramento Bee link) - As the old saying goes, one bad apple can spoil the whole bunch. It was good news for the California Legislature in December, when the Field Poll showed public support for lawmakers at its highest since 2007, and the outlook was only getting brighter. Early results from polling in March indicated voter approval of the Legislature at 46 percent, surpassing disapproval for the first time in more than a decade. Then scandal hit: State Sen. Leland Yee, D-San Francisco, was arrested by the FBI in a sweeping corruption sting. As Field finished its polling over the next week, voters' approval of the Legislature tumbled to 43 percent and disapproval jumped from 40 percent to 46 percent, representing a 9 percentage point swing in the negative direction. It's not the record lows that lawmakers saw during the depths of California's budget crisis, but public confidence has clearly been shaken by the string of recent criminal charges — and one conviction, so far — against their representatives. Firing Squad Or Hanging? AG Candidate Wants Death Penalty For Corrupt Lawmakers (CBS News Sacramento link) - A Republican candidate for California attorney general said Friday that state lawmakers who are found guilty of crimes that endanger the lives of others should face the death penalty. Republican leads in California Secretary of State race (AllVoices.com link) - The beleaguered California Republican Party received a rare piece of good news on Friday when the California Poll announced that a Republican leads in the election for secretary of state. Pete Peterson, a Pepperdine University instructor, is in the lead for chief elections officer with 30 percent support, followed by Democratic State Sen. Alex Padilla with 17 percent. 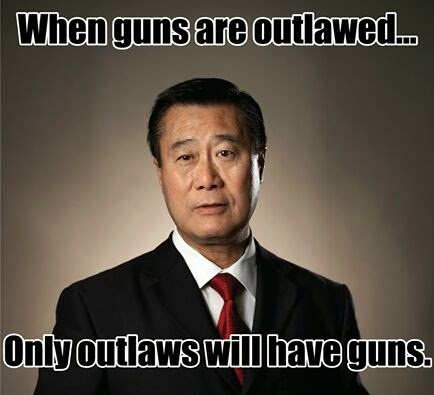 The election was upended recently when Democratic hopeful Leland Yee was indicted on federal gun trafficking charges. Another prominent candidate, Dan Schnur, has failed to gain traction so far, receiving only four percent of voter support. Schnur is a well-connected former Republican insider who has served as an aide for such GOP luminaries as former California Gov. Pete Wilson and U.S. Sen. John McCain, R-Arizona. Generally regarded as a moderate, Schnur left the Republican Party to run as an independent candidate. Also receiving single-digit support are Green Party hopeful David Curtis and Democrat Derek Chassman. Peterson is executive director of the Davenport Institute of Public Policy at Pepperdine. The think tank seeks to find and promote ways to persuade more citizens to get involved in the political process. He is a reform-minded candidate for Secretary of State who believes elected officials should be paid on the basis of how much they get done rather that a set salary. Under his plan, a 10-point performance dashboard would be launched on the state website and the salary would be based on what percentage of the goals had been completed successfully. He also proposes making it easier to track money contributed to political campaigns and enhance the use of the World Wide Web to help people find and complete state paperwork. California would be better off if we just abolished the State Senate. They seem to be hopelessly corrupt. I think the legislature should hire Judge Dredd. He would make a very effective ethics officer. How many cities in California are polluted with political corruption? The journalist who exposed the shocking City of Bell corruption suggests that they are likely all corrupt in various degrees. Pretty sad state of affairs! Taking down Measure UUT was a good first step in cleanibg up the corruption in Sierra Madre. Demand fiscal responsible elected officials and their appointees. Both Nancy Walsh and Amy Putnam have been required to take Ethics Training and they sent out the mailer anyway. It will be trailing after Tuesday as well. Susan was one of the biggest losers this election. Second one in a row. Two things Henderson tried to do this election. Pass Measure UUT and defeat Denise Delmar. She failed. The Mountain Views Sore Loser. Instead of "UUT Trailing" it should of said Yes on UUT Failing (Again). Susan, in lock step with Nancy Walsh failed to take out Denise. How delicious. Susan lost. She is sore. A sore loser. I suggest a part time legislature. that way pols can run guns on their own time. one week a year works for me. all they do is spend money and make more rules when they are in session. The fellow seems troubled by something. Perhaps a bad reaction to the election. I say we turn him over to Phil Wyman. Wyman is right on the money. These guys aren't above the law. As a matter of fact, I occasionally call the various city PD's and complain about cops that I witness committing acts that I'd be pulled over for when their sirens aren't on. Just the other day an Arcadia cop ran a red light from a turn lane, causing me to slam the brakes on to avoid a collision. I got his plate and asked to speak to a Sargent. I told him that they'd better get their head out of the clouds and remember that they're not above the law and the next time I'm pulled over, I'll be bringing this situation up in my defense. Remember, we own these guys and their claim that they pay taxes just like the rest of us is analogous to standing in a bucket and trying to lift yourself in the air by pulling on the handle. Complete imbalance.